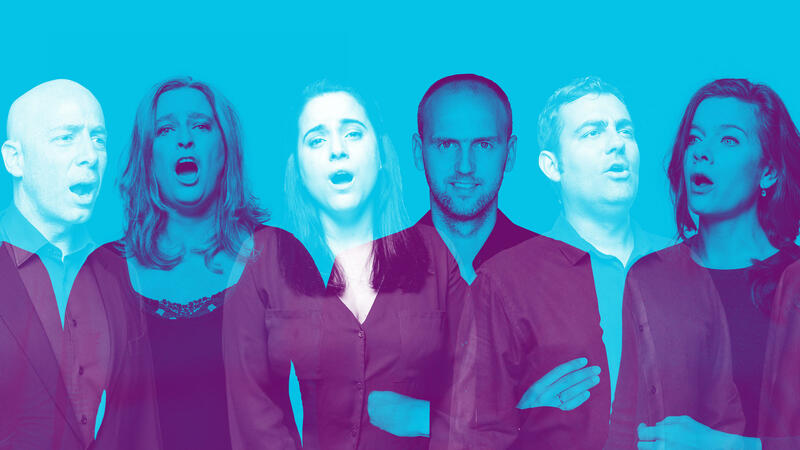 The Tallis Scholars, one of four choir groups who will be performing at Lincoln Center's The Psalms Experience. The Netherlands Chamber Choir, one of four choirs who will be performing in Lincoln Center's The Psalms Experience festival. Lincoln Center's director of programming, Jane Moss, says over the past few years, she's been thinking a lot about the contentious political landscape in the United States and abroad, the turbulent changes in the environment. That led her to the psalms. "Historically, what the psalms have been for are challenging times," Moss says. "I mean, they are really explicitly designed to help you out when the going gets rough. And they include, which I find wonderful, all sorts of human complaints to God — about, like, where are you in these challenging times?" 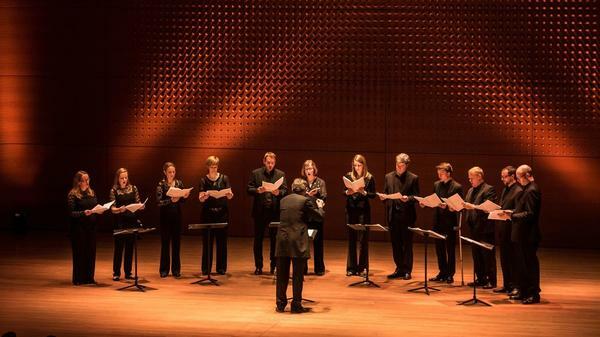 Moss and Lincoln Center teamed up with Tido Visser, the music director of the Netherlands Chamber Choir, who had the idea to create a series of 12 hour-long concerts featuring all 150 Psalms. Each concert is centered on a theme, Visser says — justice, faith, gratitude, or lamentation, for example. "The Psalms are about refugees," he says. "They are about unrighteous leaders, they are about abuse of power. Although they are two-and-a-half to three thousand year-old texts that were written by our ancestors, they are about the here and now." Four different choirs from around the world are singing music from the 12th century to today: The Choir of Trinity Wall Street, The Netherlands Chamber Choir, The Norwegian Soloists' Choir and The Tallis Scholars. Several Pulitzer Prize-winning composers were commissioned to write music for the psalms, including Caroline Shaw, who composed Psalm 84. "I really identified with [Psalm 84] because it has to do with finding a home and finding a refuge and a place and sort of celebrating this sense of safety," Shaw says. "But also there's a yearning for a home that feels very relevant today." Shaw says she was thinking of Syria as she wrote it. "The second verse is: 'The sparrow found a house and the swallow her nest, where she may place her young,' which is just a beautiful image of a bird trying to keep her children safe," she says. "People trying to keep their family safe." Another Pulitzer Prize winner, David Lang, who set Psalm 101, says that the psalms were meant to be sung. "One thing I like about the psalms is that they're sort of like a catalog of all the different ways that you could have a conversation with God," he says. "So, some of them are very hopeful and some of them are very lamenting and some of them are very full of praise; really sort of like every way you can imagine talking to God. [Psalm 101] seemed the one that was most like a negotiation." Transforming the psalms into choral music wasn't easy, says Mohammed Fairouz, another composer commissioned for the project. Choral music, he says, requires a certain commitment to simplicity. "There's nowhere to hide, the counterpoints [are] very exposed," he says. "It's sort of like the Oval Office has no corners, you know." But, in these difficult times, Visser hopes audiences will get some comfort, contemplation and community in that simplicity. "I truly believe that there's one amazing thing about choral singing," he says. "It's the fact that it unites people." Performances for The Psalms Experience began Nov. 2 and will run through Nov. 11. The Hebrew psalms have inspired composers for thousands of years. Now New York's Lincoln Center is presenting all 150 psalms in a festival of choral settings by 150 different composers, including nine U.S. premiers. It's called the "Psalms Experience," as Jeff Lunden reports. JEFF LUNDEN, BYLINE: Lincoln Center's director of programming, Jane Moss, says over the past few years, she's been thinking a lot about the contentious political landscape in the United States and abroad, the turbulent changes in the environment. And that led her to the psalms. JANE MOSS: Historically, what the psalms have been for are challenging times. I mean, they are really explicitly designed to help you out when the going gets rough (laughter). UNIDENTIFIED SINGERS: (Vocalizing, singing in foreign language). MOSS: And they include, I might add - which I find wonderful - all sorts of human complaints to God (laughter) about, like, where are you in these challenging times? LUNDEN: Moss and Lincoln Center have teamed up with Tido Visser, the music director of the Netherlands Chamber Choir, who had the idea to create a series of 12 hour-long concerts featuring every single psalm. LUNDEN: Each concert is centered on a theme, says Visser - justice, faith, gratitude, lamentation. TIDO VISSER: These psalms are about refugees. They are about unrighteous leaders. They are about abuse of power. So they are incredibly timely. Although they are two and a half to 3,000-year-old texts that were written by our ancestors, they are about the here and now. TRINITY CHOIR: (Singing in foreign language). LUNDEN: Pulitzer Prize-winning composer Caroline Shaw was commissioned to write music for Psalm 84. CAROLINE SHAW: I really identified with it because it has to do with finding a home and finding a refuge, celebrating this sense of safety. But, also, there's a yearning for a home. LUNDEN: Shaw says she was thinking of Syria as she wrote it. SHAW: The second verse is, the sparrow found a house, and the swallow her nest, where she may place her young, which is just a beautiful image of, you know, a bird trying to keep her children safe, people trying to keep their families safe. UNIDENTIFIED SINGERS: (Singing) The sparrow found a house, and the swallow her nest. DAVID LANG: They were meant to be sung. LUNDEN: That's another Pulitzer Prize winner, David Lang, who set Psalm 101. LANG: One thing I really like about the psalms is that they're sort of like a catalog of all the different ways that you could have a conversation with God. So some of them are very hopeful, and some of them are very lamenting. Really, sort of, like, every way you can imagine talking to God. This one seemed the one that was most like a negotiation. CHOIR OF TRINITY WALL STREET: (Singing) ...If you come to me? I see the faithful. I try so hard to follow them. I see the liars. I try so hard to push them away. LUNDEN: Writing choral music is not easy, says another composer commissioned for the project, Mohammed Fairouz. MOHAMMED FAIROUZ: Because it requires a certain commitment to simplicity. There's nowhere to hide. The counterpoint's very, very exposed. It's sort of like the Oval Office has no corners, you know? LUNDEN: And in these difficult times, conductor Tido Visser hopes audiences will get some comfort, contemplation and community. VISSER: I truly believe that there's one amazing thing about choral singing, and it's the fact that it unites people. UNIDENTIFIED SINGERS: (Singing) As the street lights do, and thrushes sing a requiem. Transcript provided by NPR, Copyright NPR.